A custom ID tag for your dog is a good idea because it helps ensure that your dog is easily identified if they are found. Easy ID means your dog gets back to you. ID tags also lets others know your dog is not just a stray. This saves a lot of time and resources. If a dog has an ID tag then someone can just call you and let you know they have your pooch instead of having to get animal control involved and using resources at the shelter. It is less traumatic for your dog if they don’t have to go to an animal shelter holding cage until you can pick them up! What should I put on my dog’s ID? Some pet parents choose to just have their dog’s name and a phone number on the tag while others include a street address. There is also the option of putting your name and phone number on the tag. The choice is really up to you. 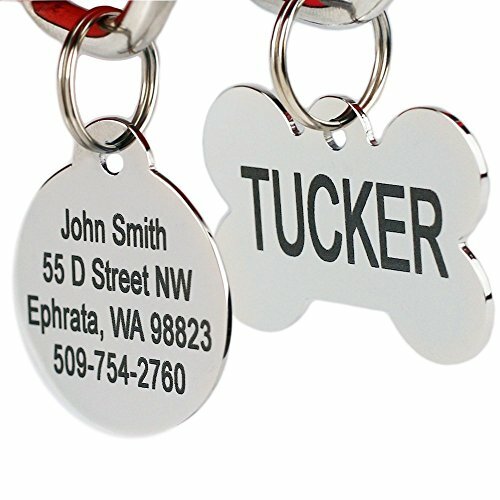 Having the street address or your real name on the collar can help get your dog back to you sooner in some cases. Phone numbers change or phones can lack a charge, be turned off, etc. If a concerned person picks up your dog roaming then they may just drop them off if they can’t reach you. If you choose just to have a name and phone number then make sure to get a new tag made if your number changes. Be cautious of tags that say they are laser engraved. In my own experience, these tags fade and become unreadable if you have a dog that runs around much. The problem can be worse if their tags hit against each other. Look for tags that are actually engraved or deeply stamped. These tags have lettering that is etched so deeply it will stay legible indefinitely even if your dog is very active. Flat tags that attach to the collar are silent and do not rattle against each other. If you don’t care for the noise that dangling tags can cause, this is an option. You can also buy tag silencers to reduce the rattle fast! Ordering custom ID tags have never been easier. Here are a few options that get to you fast and are made to last. 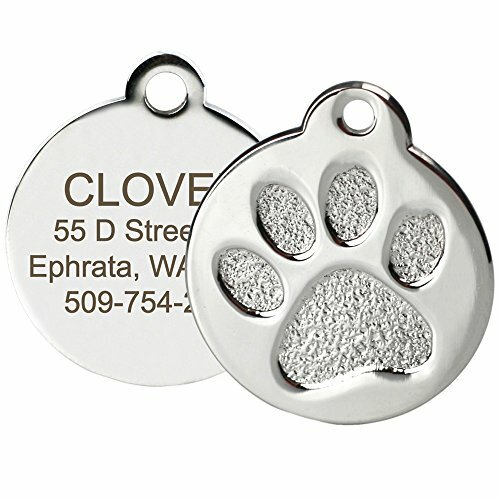 These engraved tags are made of lightweight yet very strong aluminum. You can choose a variety of fun shapes to match your dog’s style. The amount of information you can include varies on the tag shape. 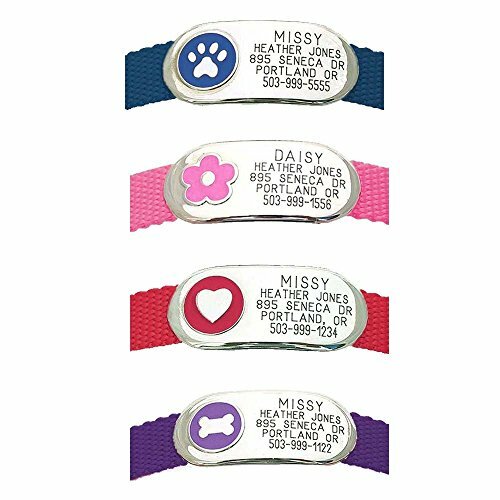 For those that want a complete tag that has their dog’s name on one side and then home info on the other side, choose any design that does not have decorative embossing on one side. 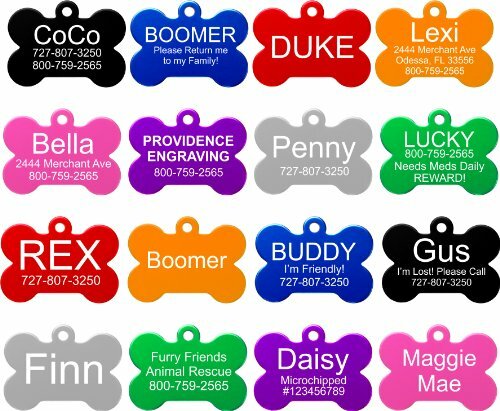 All tag shapes and designs come in a ton of different colors that can help your dog stand out when they are out and about. Stainless steel tags are a good alternative to aluminum and offer protection against rust. These tags are thick enough to be tough and stand up to a lot of good times but are lightweight enough to not overwhelm medium or small dogs. These are also available in a small size for those that have toy breeds and small mixes. I like that the company has considered that dogs come in all sizes and have different requirements for comfort when out for a stroll and romping around at the dog park. 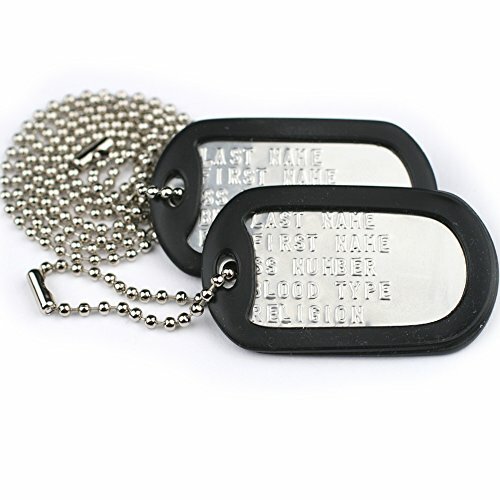 Custom US Military Dog Tags – Includes Two Personalized ID Tags Complete with Steel Chains and Silencers. 8 Color Options Available: Stainless Steel, Black, Blue, Green, Gold, Pink, Purple, or Red. This set of military dog tags is the best bargain I have seen for a long lasting tag that is deeply stamped. For this low price. You get two tags with the same engraving, so this price will take care of tag needs for two dogs or allow you to use the second tag for a different harness or collar. While these are hanging tags, they come with silencers that add to the strength and durability of the tag. The one disadvantage of this style is that they are too big for small and toy breeds. If you don’t like the classic silver color, then you can pick from a variety of options. The silencers on the outer edge are black regardless of the actual tag color. Up to three lines can be engraved. While I did mention to be aware of laser engraving, this tag is too cute to ignore. If you have a mostly indoor dog or one that doesn’t get rough a lot then this tag offers some style. This smaller fashion tag is ideal for small dogs and cats. Choose three short lines of text with each tag. I love the design of this tag. It is made of stainless steel. While it is laser engraved, this is one of the laser tags that are made a bit better. With over 1,700 over the top reviews from pet parents, this laser engraved tag is an exception to the rule. You can choose two different sizes to suit your dogs. If you want to ensure a quiet experience then get the tags with included silencers that glow in the dark for better visibility under low light conditions like those evening walks! 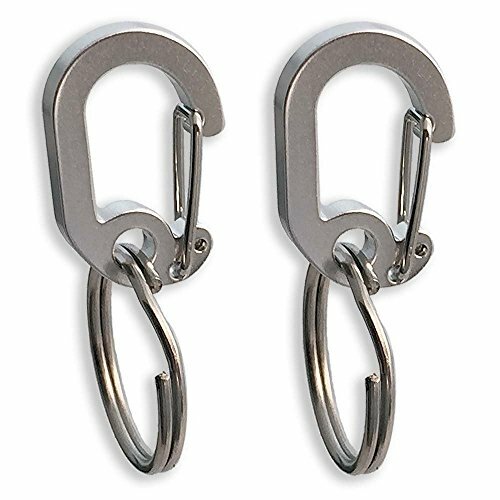 These quick clips are great for those that want a set of tags that they can move back and forth between harnesses and collars. This two pack makes it easy to attach ID to your dog. This can help eliminate the need for having seperate tags for every collar or harness your dog owns. These flat tags are awesome. They attach to your dog’s collar easily and are totally silent. This flat design can be more comfortable for dogs that get annoyed with dangling tags. The heavy-duty velcro wraps around your dog’s collar for a firm hold. This means you can use the tag for multiple collars if you are the type of pet parent that likes to mix up what your dog wears. This snazzy looking flat tag adds some charm to your pet’s ID. Choose from a paw, flower, heart, or bone emblem next to three heavy engraved lines of text. 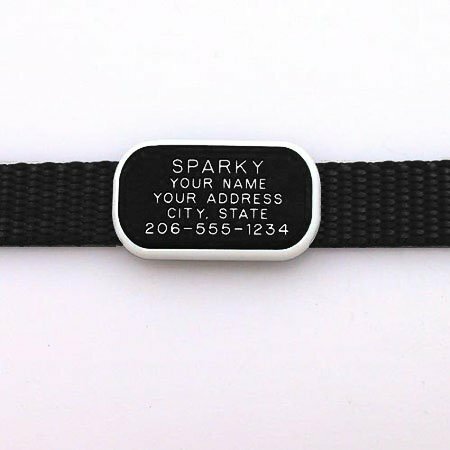 This tag attaches with heavy-duty velcro to any collar. The one thing to remember when ordering this tag is to get the size you need to fit your pet’s collar width. This is another tag that is great about having different sizes for cats and all sizes of dogs too. 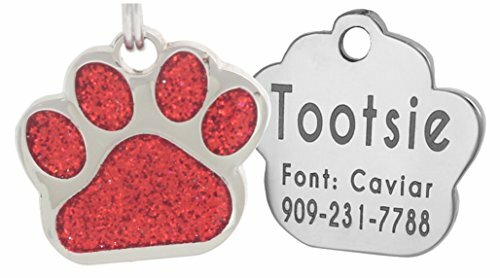 I was intrigued by the idea of creating your own pet ID tags but after seeing how inexpensive and high quality the options are from Amazon I came to the conclusion that for the average pet parent it is not practical to make your own. You would have to purchase metal tags and an engraver tool and it would be quite difficult to do a quality job. One other option for inexpensive tags is to visit a farm or feed store. The heavily stamped tags they sell are very durable and cost just a few dollars. These are designed for farm and hunting dogs that can really test the durability of any product. They attach to a collar with included brads. If you buy a collar at the same time they will do it for you too! Sometimes a tag doesn’t work out so well for a dog. The tag may rub, rattle, or you may realize your pooch likes to play and romp around more than you thought. If that’s the case, they need a tag that is more durable than some of the small cute tags on the list. Luckily, tags are inexpensive and easy to get so you can have several styles for different colors and situations if you want. While a cute paw print tag may be great for socializing, you might want to stick on a military style dog tag for a long hiking and camping excursion.